Designed to promote good posture and a correct sitting position, kneeling chairs are the way forward when it comes to seating solutions for your office. The health and wellbeing of your employees is important, so why not look after them by investing in these innovative and ergonomically designed chairs? Featuring thick padded and upholstered seats and knee rests, our office chairs offer optimum comfort. 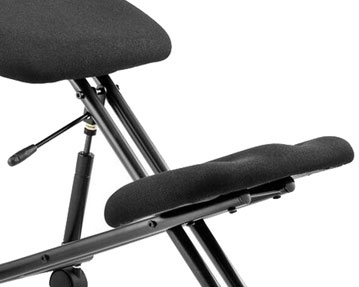 Each design is height adjustable, and the seats and knee pads can be altered manually using the hand wheel provided. 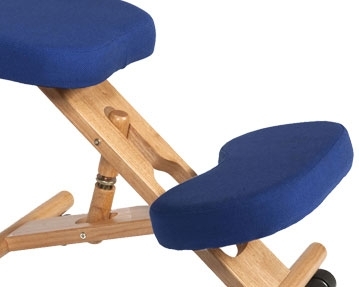 These products are especially good for those who may struggle to sit comfortably in a completely upright position at their workstations. The kneeling design of these chairs means workers can adjust the tilt at which they’re sitting to find their preferred sitting stance. Our kneeling chairs are available in a variety of different fabric colours, including red, blue, green and charcoal, so you shouldn’t struggle to find a style that perfectly complements your office decor.